Mark Jenkins is an American artist most widely known for his hyper realistic street sculptures made from packing tape. His work focuses on themes of marginalization to create a stage that absorbs passers by. 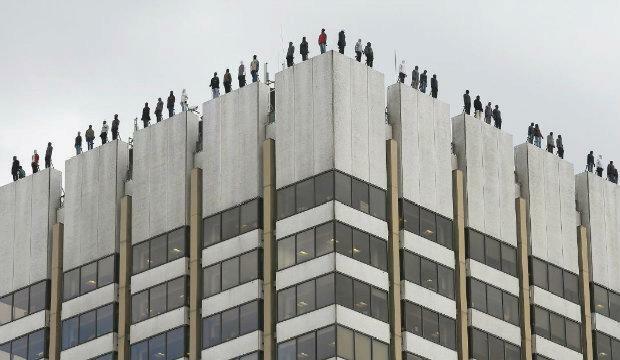 The statistics are shocking, every two hours a man in the UK takes his own life. Male suicide and mental health is a big issue that can’t be ignored any longer. It’s unacceptable that so many men are dying from suicide on a daily basis, yet so few people are taking about it. To stop people in their tracks, make them pay attention and inspire much needed conversation and action around suicide, the internationally renowned artist Mark Jenkins, and his collaborator Sandra Fernandez, to creat 84 individual sculptures, Friends and family members of the deceased helped in the creation process of the figures, Each one, a poignant reminder of a real life lost and a call to society to come together and ultimately take a stand against male suicide.